Yep, we're back with another Road Show and the line up is looking sweet. We're proud to present as our feature guests renowned slam poets from the USA Carrie Rudzinski and Ken Arkind currently touring NZ. Ably supporting these wandering wordsmiths are Michelle Bolton, Doc Drumheller, Ciaran Fox, Kimberley Holmes and Phoebe Wright. Free + first 30 peeps get a free chapbook! Ken Arkind is a National Poetry Slam Champion, Nuyorican Poets Café Grand Slam Champion, published author, and featured Tedx Speaer who has performed his work in 49 States, Australia, New Zealand Ireland, the UK, and at over 150 colleges and universities. He is the Executive Director and head Brave New Voices coach for The Denver Minor Disturbance Youth Poetry Project, an independent literary arts organization dedicated to helping Colorado youth find their voices through the mediums of poetry and performance, and current Brave New Voices International Youth Poetry Slam Champions. For more about Ken see here. 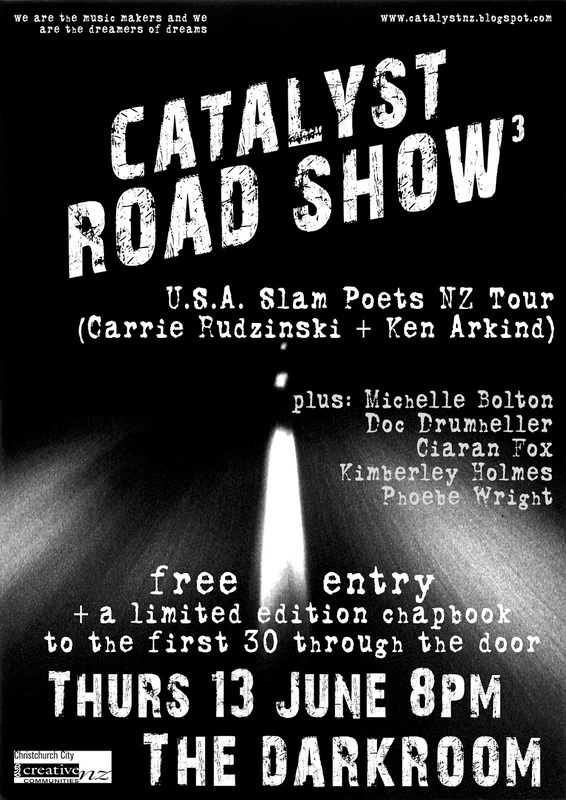 Carrie Rudzinski, named “Best Female Poet” and “Best of The Rest” at her first national poetry competition in 2008, is a full time performance poet who has performed her work across the United States, New Zealand, Australia, and India. She represented the Boston Poetry Slam at the 2010 Individual World Poetry Slam, twice at the National Poetry Slam (2010/2011), and ranked 14th at the 2011 Women Of The World Poetry Slam. Most recently, she represented Denver’s Mercury Café at the 2013 Women Of The World Poetry Slam. Her newest collection of work, The Shotgun Speaks, will be published in May 2013. For more about Carrie see here.